Click here to download half-sheet Action Steps flyer! "After the mass shooting in Parkland, Fla., in February, Congress did not act. But state legislatures did, passing 69 gun control measures this year — more than any other year since the Newtown, Conn., massacre in 2012, and more than three times the number passed in 2017." (Read full article here). In the country, New Jersey passed the most laws tightening firearms restrictions. In response to the mass shooting at the Tree of Life Synagogue in Pittsburgh, the Rev. Robert Moore, Executive Director of the Princeton-based Coalition for Peace Action—of which Ceasefire NJ is a Project—made the following statement. “We are horrified and deeply saddened by yet another mass shooting, this time at Tree of Life Synagogue in Pittsburgh. I condemn this virulent act of anti-Semitism and hate in the strongest possible terms. While President Trump also condemned it, I find it profoundly troubling that the rate of hate crimes has increased substantially since he became President. Words matter, and his inflammatory rhetoric—such as praising a Congressman who body slammed a reporter—could be giving sanction to such violent behavior. All people of good will need to stand united and in full solidarity against such hate crimes. We need to do our very best to reduce them, but it is unlikely they will be eliminated any time soon. That is why we need a national Assault Weapons Ban. They are weapons designed for the battlefield and are the weapon of choice for many mass shooters. We need to at least prevent mass shooters from legally purchasing them, as the Pittsburgh shooter did. When they were nationally banned in the US from 1994-2004, the number of fatal shootings using them went down by 2/3. After Australia had a mass shooting in 1996 in which a single person murdered 36 people, that country banned assault weapons and mandated that the ones already in circulation be destroyed. They have not had a single mass shooting since. "As Las Vegas prepares to honor those killed in last year's shooting massacre at a country music festival, the federal government moved ahead Monday with plans to ban an accessory that investigators said gave the gunman extra firepower. The Justice Department confirmed that a proposed rule to ban bump stocks was sent late last week to the Office of Management and Budget for review. After a review that could last up to 90 days, the proposal will be published in the Federal Register, inviting public comment. It would ban the manufacture, importation and possession of bump stocks. Once the rule becomes effective, anyone owning one would be required to destroy it." (Read full article here). As we’ve witnessed in the horrifyingly frequent mass shootings in America, assault weapons are the shooter’s weapon of choice. They are designed for the battlefield, which is the only place they should be allowed. It is outrageous that Supreme Court nominee Brett Kavanaugh ruled that banning such weapons of war from America’s streets was illegal. He has taken the preposterous position that regulating such weapons shouldn’t be allowed because they are in such wide circulation. Using similar reasoning, one could conclude that cars shouldn’t be regulated, because they are so widespread. Thank God that with citizen pressure, public health measures like seat belts and air bags were mandated. This has saved countless lives, cutting annual car accident fatalities by about 20,000 per year. Annual deaths from guns now outnumber those from cars. Even the late Justice Antonin Scalia, one of the most conservative members of the Supreme Court, made clear that guns, the most dangerous consumer product of all, can be regulated. To urge your US Senators to oppose Judge Kavanaugh’s nomination, call your US Senators via the Capitol Switchboard (202) 224-3121. Gov. Murphy Signs Gun Safety Bills into Law! On June 13, 2018, Gov. Phil Murphy signed a package of gun violence prevention bills into law. This is the culmination of an effort spearheaded by Ceasefire NJ since last fall! View slideshow below to see how these landmark bills were passed! Ceasefire NJ leaders with Governor Murphy at the signing event! Smiles all around as Governor Murphy signs the bills into law! Thanks to all who called and emailed Senators, and who were able to attend committee hearings in the past months. Thanks all for great turnout at gun safety bill hearing! On Monday, May 21st, around 75 gun violence prevention activists showed up to support and/or testify in favor of gun safety bills being heard by the NJ Senate Budget and Appropriations Committee. In comparison, only one or two NRA supporters were there, and no one testified in opposition to the bills! 6 out of 7 of the bills passed through Committee. One was held for adjustments, but should proceed soon. The Rev. Robert Moore (left) testifies in support of all seven bills. Joan talks with the Rev. Bob Moore, Executive Director, Coalition for Peace Action, and Dolores Phillips, Legislative Director of Ceasefire NJ. in a thorough, timely and informative look at where we are today. They were joined by Rev. Carol Haag, Unitarian Universalist Minister. And even as they shared views on assault weapons, unbeknownst to them, gunfire was reported at a Maryland high school. Rev. Moore pointed out that Assault Weapons were Banned in New Jersey since 1991, and banned nationally from 1994 to 2004 but were dropped in a "sunset clause." Dolores Phillips underscored the need for legislation. All of the speakers noted the upcoming March for Our Lives set for Saturday, March 24th in many parts of the country including Washington, D.C. and Princeton. Click here to watch video! CFPA delegation testifies on package of gun safety bills at the NJ Senate Law and Public Safety Committee Hearing on April 16, 2018. Pictured left to right: Mark Pepper, David Brown, Dolores Phillips, and Jeannine Clayton Coyne. Thank you very much to everyone that made calls, sent emails, asked others to do so, and to those who came down to State House Senate Law & Public Safety Committee to testify. Special thanks to David Brown, Ph.D., Mark Pepper, M.D., Larry Kane, and his wife Marlene, Jeannine Clayton Coyne, and Hanan Issacs, Esq. for coming down to Trenton today amidst the flooding and testifying. Everyone's testimony made a difference. /A.2758 Greenwald), was heavily debated with all Democrats (4) voting yes and Senator Bateman unfortunately voting no. The Mental Health Duty to Warn Bill (A.1181/S.160) was voted out of committee unanimously after a two hour debate. The "Red Flag Bill" or ERPO, (S.2259/A.1217) was amended in committee with several procedural amendments the Administrative Offices of the Courts brought in the last minute and no one got to read them, but the bill was predetermined to be released from committee. Sen. Bateman felt he could not vote until he saw the amendments. The new amendments were not brought to the committee until 11:30 am. All the other bills were passed unanimously: banning the possession of armor piercing ammunition, reducing the maximum capacity of ammunition magazines to 10 rounds from 15 rounds (amended to grandfather some guns), extending background checks to private sales, and finally a new bill that would prevent the home, or under-the-radar manufacture of untraceable firearms, including 3-D printing. The bills now go to NJ Senate Budget and Appropriations Committee. NJ will now publish the numbers of gun crimes by municipality on its website, as well as quarterly state-by-state data on where guns used in NJ crimes were purchased. Click here to read full text of the executive order. A1217: Creates restraining orders in the state allowing family members and others to ask a judge to have a person's guns seized and ban them from buying weapons for up to a year. It passed 59-13, with 4 abstentions. A1181: Mandates law enforcement in the state take a person's guns if a mental health professional determines they are a threat to themselves or others. It passed 62-7, with 7 abstentions. A2758: Strictly defines that state residents need to show a "justifiable need" to obtain a permit to carry a handgun. It passed 48-26, with 2 abstentions. A2757: Requires all private gun sales in the state to go through a licensed dealer who can perform an additional background check at the point of sale. It passed 61-9, with 5 abstentions. A2759: Creates an outright ban in the state on possessing armor-piercing bullets, which are already federally outlawed. It passed 75-0, with 1 abstention. A2761: Ban magazines in the state that hold more than 10 rounds, with some exceptions. It passed 48-25, with 3 abstentions. People who currently own magazines with more than 10 rounds could keep their firearms, though they would have to register them and pay a $50 fee. These six bills will now go on to the State Senate, and then to Governor Murphy, thanks to all the activists and organizers who showed up for hearings, rallies, and meetings to push these bills through! Dolores Phillips testified on Thursday, 3/22, at an NJ Assembly Appropriations Committee hearing on three gun violence prevention bills. All three bills were released to the full Assembly, to be voted on 3/26, along with three other gun violence prevention bills. Dolores Phillips, Ceasefire NJ's Legislative Director, is second from the left. WE BROKE THE NRA’S STANGLEHOLD BEFORE. WE CAN DO IT AGAIN! In the wake of the mass shooting at a high school in Parkland, Florida, its students refused to accept the usual “thoughts and prayers” as enough. It’s very empowering to see their amazing leadership, which has already resulted in stronger gun safety laws in Florida, and mobilized massive numbers of students across the nation. The weapons of choice for such mass shootings are known as assault weapons. They were designed for the battlefield, which is the only place they should be allowed. They can rapidly fire bullets as fast as the shooter can pull the trigger. But so far, no significant gun safety legislation is moving toward passage in the US Congress. The stranglehold of the NRA has still been effective in preventing that. President Trump initially voiced support for some measures, such as strengthening background checks and raising the minimum age to purchase rifles, but then caved to the pressure and didn’t follow through after a White House meeting with the NRA. The hopeful news in taking on such a monumental challenge as an Assault Weapons Ban is that New Jersey has banned such weapons since 1991, and they were banned nationally from 1994-2004. Tragically, the national ban had a sunset clause after ten years, so it automatically expired when then President George W. Bush refused to seek its renewal. New Jersey’s Assault Weapons Ban is a good example of how the NRA’s stranglehold can be broken. In 1993, after the NRA had helped elect a pro-NRA majority in the NJ legislature in 1991, it voted to rescind New Jersey’s Ban in 1993. Then Governor Florio vetoed the rescission, and a vote to override that veto easily succeeded in the NJ Assembly. A vote was scheduled three weeks later in the NJ Senate. We in Ceasefire NJ mobilized intensively, even though this predated online communication. Many of the 70% of New Jerseyans who wanted to keep the ban urgently contacted their NJ State Senator. What followed was the closest thing I’ve ever seen to a legislative miracle: not a single NJ Senator voted to rescind the ban! When the pro-NRA Senator who represented my district was asked why he voted to keep the ban, he said it was because he got 2,000 phone calls, and 90% urged keeping the ban. The fact that we were successful in breaking the NRA’s stranglehold in New Jersey at least partly inspired the successful effort the next year to pass the National Assault Weapons Ban. Unlike the New Jersey Ban, that included a grandfather clause. Nonetheless, reputable studies showed that the National Ban resulted in a nearly 2/3 reduction in shootings with assault weapons. We can beat the NRA again, and pass a new National Assault Weapons Ban and other gun safety measures. The incredible leadership of students has been truly inspiring, and we have been pleased to begin collaborating and working synergistically with these new young activists. But it is nearly impossible that significant change will happen quickly. We need to make this a major issue in the 2018 Congressional elections. In the 2006 mid-terms, the Coalition for Peace Action (CFPA), of which Ceasefire NJ is a Project, helped make the Iraq War a litmus test issue, and the majority of those elected opposed that war. By 2008, then President George Bush agreed to end US participation in that war. Even though many high school students can’t yet vote, all of us can play an activist role in helping make gun safety a litmus test issue in congressional elections, including this spring’s Primaries and the November general election. That will need to be followed up by continuing to challenge the NRA’s stranglehold by lobbying, public education, protests, and media work. On March 24, millions are expected to come to Washington DC and have marches and rallies in over 750 communities across the nation. CFPA is actively supporting the national March and local marches in our region. If this activism is sustained over time, we can again break the NRA’s stranglehold! "An NYPD officer only has an 18 percent chance of hitting his or her target in a gun fight. 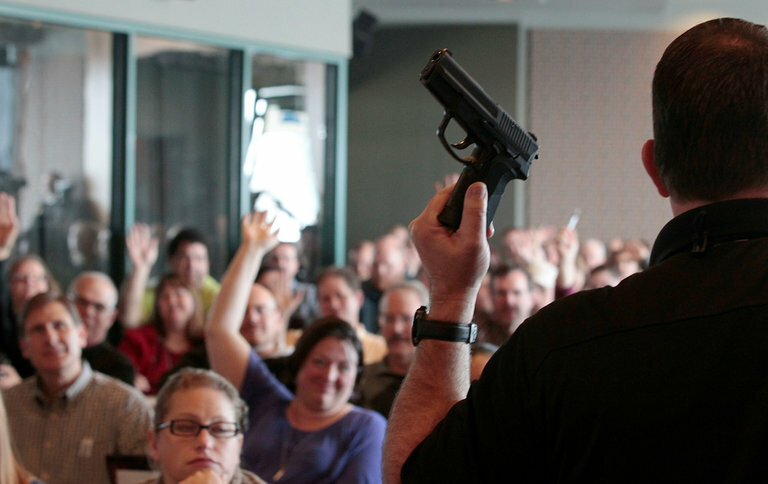 Why would anyone expect an armed teacher - trained or not -- to do any better? And what if police arrived on the scene of a school shooting to find multiple people wielding firearms? How would they know which gun-wielding person was the bad guy? For these reasons and many more, arming teachers is simply a terrible idea. But beyond the lack of merit, we should be equally or more concerned with the spirit of this grotesque proposal. We teachers know well the churn of trends, fads, and "bold" new ideas in education. In fact, teaching is often two jobs: one is navigating the changes, pushing paper around, and other sorts of work nonsense that's part of just about any profession. The other job -- the real job -- is to teach and love our students. And as such, many of us have developed a healthy skepticism for non-educators who want to change our classrooms. We know learning, and we also know that there is plenty of money to be made for anyone who can sell an idea to schools. So teachers are both bridge and buffer between your children and the ideas of those who claim to know what's best for them. Except this time, instead of dry erase markers or smart boards, they want to give us guns. And we do not want them." (Read full opinion here). "I will immodestly state that among professors in the United States, I am almost certainly one of the best shooters. But I would never bring a weapon into a classroom. The presence of a firearm is always an invitation to violence. Weapons have no place in a learning environment. When I was a young Marine, I had to learn how to use many weapons. It was part of my mission to “support and defend the Constitution of the United States.” My mission these days is to write books and teach literature and creative writing. It’s a noble calling, too. But no one should be asked to put his life on the line for it." (Read full article here). "The N.R.A.’s impact comes, in large part, from the simplicity of the incentives it presents to political candidates: letter grades, based on their record on the Second Amendment, that guide the N.R.A.’s involvement in elections. Lawmakers who earn an “A” rating can count on the group not to oppose them when they run for re-election or higher office. For candidates who earn lower grades, the group deploys a range of blunt-force methods against them. The N.R.A. mails the voter guides to its five million members, displaying images of favored candidates on the front, and some state chapters bombard supporters with emails about coming elections. The organization’s calculation is that its money is better spent on maintaining a motivated base of gun rights supporters than on bankrolling candidates directly. Compared with the towering sums of money donated to House and Senate candidates in the last cycle — $1.7 billion — the N.R.A.’s direct contributions were almost a rounding error. The N.R.A. directly donated a total of just $1.1 million to candidates for federal office in 2016, with 99 percent of that money going to Republicans, while giving a total of only $309,000 in direct contributions to state legislative candidates in 2016 and 2017, according to tallies by the Center for Responsive Politics, which tracks federal donations, and the National Institute on Money in State Politics, which tracks state-level donations." (Read full article here). "Friday’s rally was sponsored by several activist groups including the BuxMont Coalition for Peace Action and The Peace Center in Langhorne. “There’s no quietness here,” said coalition organizer Cathy Leary, referencing the constant blare coming from car horns as passing drivers responded to the signs requesting they honk for support. Leary is also in favor of more specialized care for those suffering from mental illness, but she considers that is an entirely different conversation than “sensible, common sense” gun control when it comes to preventing these types of killings. “What happens is they get intermixed and then nothing changes. Ever,” she added. Kathey O’Brien, of Solebury, said she’s been outspoken on the issue since the 1980s. “It’s getting worse and worse,” she said Friday. “Too many of our babies and children have died.”" (Click to read full article). "Gov. Phil Murphy was back in South Jersey on Tuesday where he participated in a gun safety roundtable, reiterating his promise to sign into law several measures that his Republican predecessor vetoed. “Good news, we have among the smartest, most progressive gun laws in the nation. That’s a fact. It’s also a fact that they can be stronger. There’s no reason why we can’t strengthen them,” the Democrat said during the discussion at the Katz Jewish Community Center. The event was organized and led by Assembly Majority Leader Lou Greenwald, D-6th of Voorhees, one of the key leaders of an effort to approve additional gun control measures in the wake of mass shootings like Sandy Hook in Connecticut and the October massacre in Las Vegas. Murphy and Greenwald were joined at the center by the leaders of several gun safety groups, including the Brady Campaign, Ceasefire NJ, the Coalition for Peace Action and the Giffords: Courage to Fight Gun Violence group." (Read full article here). Ceasefire NJ Legislative Director Dolores Phillips and CFPA Executive Director Rev. Bob Moore participated in a gun violence prevention roundtable with NJ Governor Phil Murphy and NJ Assembly Majority Leader Lou Greenwald, on February 13th in Cherry Hill. "There were, on average, 3.75 unintentional gun deaths each year in the state between 2009 and 2016, according to the Centers for Disease Control. During the previous decade, an average of 11 people died each year, according to the data. The decline may be due to the state's gun laws, said the Rev. Robert Moore, executive director of the Coalition for Peace Action, which includes the gun violence prevention campaign CeaseFire NJ. Over several decades, the state has made leaving a loaded gun where a child can access it punishable by imprisonment, and required sellers to provide trigger locks or locked gun cases with each gun purchase, among other laws. "I think these laws made a difference," Moore said." (Read full article here). NJTV NEWS, "Gun rights group files suit to overturn concealed carry law"
Click here to watch 3-minute segment, featuring a critique from our Executive Director, Rev. Bob Moore. “The fact that he runs an ATM business and may carry a lot of cash … Listen, the bottom line is that citizens are on their own in an emergency and the government shouldn’t interfere with their ability to protect themselves,” said the president of Association of New Jersey Rifle and Pistol Clubs, Scott Bach. Bach joined Rogers in the lawsuit against New Jersey, the State Police, Wall Township and others filed in federal court in Newark. Bach says, Rogers passed all the background checks and training requirements for a permit, but didn’t qualify because New Jersey’s concealed carry law requires applicants to prove a strictly-defined “justifiable need” in order to get a permit. The complaint asks the court to overturn New Jersey’s concealed carry law and award permits to the plaintiffs. But it will undoubtedly face a legal firefight. “There already are too many guns on our streets and simply adding more to the equation will not make us, or our communities, any safer,” said Gov. Phil Murphy at an event on Jan. 26. Newly-elected Murphy, who’s closely aligned with gun control advocates, recently moved to re-tighten state concealed carry standards. New Jersey’s one of seven states that severely restricts permits. But plaintiffs remain undeterred. Even though previous legal challenges have failed — and could fail again they admit. Bach says recent rulings in other jurisdictions give their case a better chance at success on appeal to the U.S. Supreme Court. “We have a call out to anybody who is an average, ordinary citizen, who applied for their concealed carry permit and have been denied. We would like them to contact us because there may be room in the case for others,” said Bach. 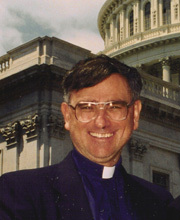 CFPA Director Rev. Bob Moore (center) was part of a January 26 press conference in Trenton with NJ Gov. Phil Murphy and NJ Senate President Steve Sweeney announcing new initiatives on gun violence prevention. Dolores Phillips, Legislative Director of CFPA's gun violence prevention project, Ceasefire NJ, was also present. We're pleased to report that at the press conference pictured above, Gov. Murphy and his Attorney General announced that they are taking steps to restore the "justifiable need" criteria for getting a concealed carry gun permit in NJ. That means that to qualify for getting such a permit, a person needs to show that they are facing a specific threat that necessitates them carrying a gun, e.g. a previous attack. It can't just be a general perceived threat of danger. Previously, former Gov. Christie, had attempted to unilaterally loosen the criteria so anyone who perceived such a general threat would qualify to get a permit. This was strongly opposed by the NJ legislature, both by bills and a court challenge. CFPA's Ceasefire NJ Project (CFNJ) had spearheaded citizen activism to oppose Christie's changes, including coordinating testimony against it at hearings held by the NJ State Police; and supporting legislation and court challenges against it. Special thanks to Dolores Phillips, and counsel Howard Moskowitz! For immediate release: January 15, 2018, Martin Luther King's Birthday: CEASEFIRE NJ PRAISES GOV. CHRISTIE FOR SIGNING BIPARTISAN BAN ON BUMP STOCKS! The Rev. Robert Moore, Executive Director of the Princeton-based Coalition for Peace Action, of which Ceasefire NJ (CFNJ) is a Project, made the following statement following the January 15 signing of a Bump Stock Ban into NJ Law. It previously passed the NJ Legislature unanimously. “We applaud Gov. Christie's signing into law of a Ban on Bump Stocks, the device used by the Las Vegas mass shooter to effectively turn his weapons into fully automatic machine guns, leading to the largest mass shooting in modern US history. We are very pleased that partisan politics played no part in this move toward making the people of New Jersey safer from such mass shootings. The NJ Legislature unanimously passed it earlier this month on a bipartisan basis, and Gov. Christie also set partisan politics aside and timely acted on the official birthday observance of the Rev. Dr. Martin Luther King, Jr, who himself was a victim of gun violence. The CFNJ Project organzied calls to Gov Chrstie's office urging him to sign the Ban. It earlier organized testimony to three Legislative Committees in favor of the ban, while the NRA and allies opposed it at each hearing. CFNJ also advocated the Ban at recent meetings with the Majority Leaders of the NJ Legislature. On this official birthday of the Rev. Dr. Martin Luther King, who himself was a victim of gun violence, we call on the US Congress to pass and President Trump to sign sucha bill to follow the model of New Jersey, set partisan poltiics aside, and effectuate a national Bump Stock Ban as rapidly as possible." On December 20, the Coalition for Peace Action's Ceasefire NJ Project co-led a 12 person delegation of gun violence prevention leaders from across the state with NJ State Senate Majority Leader Senator Loretta Weinberg (front, middle) to discuss gun violence prevention legislation. Another Legislative Victory on Banning Bump Stocks! I'm pleased to inform you that with the excellent leadership of Ceasefire NJ (CFNJ) Legislative Director, Dolores Phillips, the NJ Senate's Law and Public Safety Committee unanimously approved yesterday a Ban on Bump Stocks! This is an important bipartisan victory following the earlier passage by 8-0 in the NJ Assembly Law and Public Safety Committee. While the US Congress is gridlocked on moving forward on this common sense step toward gun safety, CFPA's Ceasefire NJ Project remains hard at work to get victories at the state level! But such outstanding successes are endangered due to inadequate funding! So I strongly urge you to click here to make you year-end tax deductible Holiday gift to sustain and intensify CFPA's work on gun violence prevention. We face great challenges as we come toward the end of this year, and prepare to enter a new year. For more detail, and motivation to contribute, click to see the online version of our Year End Appeal. New Jersey on Thursday got one step closer to banning a firearms accessory allegedly used by the gunman in the Las Vegas mass shooting. The state Assembly's law and public safety committee voted 8-0, with one abstention, to advance a Democrat-sponsored bill that would prohibit the sale and possession of "bump stocks" in the state. Bump stocks can be affixed to semiautomatic riffles to allow them to fire bullets more rapidly, mimicking automatic weapons, which are mostly illegal in the U.S.
A fierce national debate over the accessory emerged in the wake of the Las Vegas massacre. The gunman had 12 of the devices in his hotel room, allegedly helping him to kill 58 people and injure 500 more in a matter of minutes. WHAT THE BILL WOULD DO: The legislation (S3477/A5200) would prohibit the sale and possession of bump stocks in New Jersey and set up criminal penalties for those who violate the ban. Violators could face three to five years in prison, a fine of up to $15,000, or both. Click here to read full article. It has happened yet again: Inevitably, predictably, fatefully, a gunman shot dead 26 people in a Texas church on Sunday. These incidents are peculiarly American tragedies, and what’s particularly heartbreaking is that they aren’t shocking. People all over the world become furious and try to harm others, but only in the United States do we suffer such mass shootings so regularly; only in the U.S. do we lose one person every 15 minutes to gun violence. Two of the deadliest mass shootings in modern American history have occurred in the last six weeks. So let’s not just mourn the dead, let’s not just lower flags and make somber speeches. Let’s also learn lessons from these tragedies, so that there can be fewer of them. In particular, I suggest that we try a new approach to reducing gun violence – a public health strategy. Click here to read full article and see infographic. Yet another mass shooting occurred at a Texas church on November 5, killing 26 people. We must act to prevent more mass shootings, which are now occurring at an average of more than one per day. We don’t yet know this shooter’s motives, but we do know that he used an assault weapon, mass shooters’ weapon of choice. They are meant for the battlefield, which is the only place they should be allowed. They can rapidly fire bullets as fast as the shooter can pull the trigger. We need to ban them nationally. New Jersey’s Assault Weapons Ban remains the strongest such ban in the nation. In 1993, we in Ceasefire NJ helped successfully defend the NJ Ban against an NRA effort to rescind it. The fact that we were successful in breaking the NRA’s stranglehold in New Jersey helped inspire the passage the next year of a ten-year National Assault Weapons Ban, resulting in a 2/3 reduction in crimes using them. We must pass a National Assault Weapons Ban again. But it will take average citizens to persistently advocate for it. To learn more, visit peacecoalition.org and click the Ceasefire NJ icon on the right. Click here for video coverage of a Vigil for Las Vegas, held in Union on October 6, 2017. Coalition for Peace Action (CFPA) Executive Director Rev. Bob Moore was a speaker. Guns do not make individuals, their families, or homes safer and they result in far more deaths to loved ones than to an intruder intending to cause harm.3 Often forgotten is that 60.7% of the gun deaths in 2015 in the United States were suicides.1 Means used to attempt suicide matter; guns will result in suicidal deaths well over 90% of the time, whereas ingestion of pills or wrist cutting will be unsuccessful more than 90% of the time. The majority of people who try to commit suicide but survive the attempt will not go on to die from suicide4; if the attempt is with a gun, there will be no second chance at life. Click here to read full article. Our thoughts and prayers go out to the nearly 600 victims and their families of the largest mass shooting in US history last Sunday night in Las Vegas. The mass carnage made that city into what can only be described as a war zone. But our response needs to include more than prayers and moments of silence. We need to act to prevent more mass shootings, which are now occurring at an average of more than one per day. The weapons of choice for such mass shootings are known as assault weapons. They were designed for the battlefield, which is the only place they should be allowed. They can rapidly fire bullets as fast as the shooter can pull the trigger. They were easily adapted by the shooter to become automatic weapons where a single pull of the trigger can spray bullets with no pause. The hopeful news in taking on such a monumental but urgent challenge is that New Jersey has banned such weapons since 1991, and they were banned nationally from 1994-2004. Tragically, the national ban had a sunset clause after ten years, so it automatically expired when then President George W. Bush refused to seek its renewal. New Jersey’s Assault Weapons Ban is a good basis for the feasibility of a renewed national ban. In 1993, after the NRA had helped elect an anti-assault-weapons ban majority in the NJ legislature in 1991, large majorities voted to rescind New Jersey’s Ban. Then Governor Florio vetoed the rescission, and a vote to over-ride that veto easily succeeded in the NJ Assembly. Three weeks later, a vote was scheduled in the NJ Senate. We in Ceasefire NJ mobilized intensively in the faith community and elsewhere. Many of the 70% of New Jerseyans who wanted to keep the ban urgently contacted their NJ Senator. What followed was the closest thing I’ve ever seen to a legislative miracle: not a single NJ Senator voted to rescind the ban! When the Senator who represented our district, who supported the NRA, was asked why he voted to keep the ban, he said it was because he got 2,000 phone calls and 90% urged keeping the ban. The working paper, released this week by the National Bureau of Economic Research, challenges the effectiveness of RTC laws and could have a significant impact on pending litigation between the National Rifle Association and the state of California. Click here to read full article. The June 14 mass shooting at a Congressional Republican baseball practice in Alexandria, VA before the annual Congressional charity baseball game, is yet another horrifying reminder of the human death and suffering caused by America’s continuing epidemic of gun violence. Just that one day, there were mass shootings in Brooklyn and San Francisco, bringing the total of such shootings this year to over 150—an average of one every day! My prayers are with all those victims, every one of whose life is precious in God’s sight, as well as with their loved ones. There can be absolutely no justification for such mass violence. All Americans, regardless of political party or any other aspect of their identity, deserve to be safe from gun violence. It is critical to not only mourn, but also to organize. The Ceasefire NJ Project of the Coalition for Peace Action has successfully led efforts to preserve New Jersey’s Assault Weapons Ban, passage of the first Childproof Handgun Law in the nation, and, most recently, to keep guns away from domestic abusers. Those interested in becoming involved are encouraged to visit peacecoalition.org and click the Ceasefire NJ icon on the right hand side. Act NOW to Prevent Massive Gun Proliferation! Dolores Phillips, legislative director for Ceasefire New Jersey -- self-described as 'the oldest and largest gun violence prevention group in New Jersey' -- told Daily Voice that her organization has no position on the bill. "We have no problem with trained retired officers who may continue to carry handguns to age 75, and expanding such list." She said the bill passed out of committee easily, with no debate or controversy, and she expects it will be on Gov. Chris Christie's desk later this month. Click here to read full article. Ceasefire New Jersey (CFNJ), the state’s leading gun violence prevention group, today hailed the signing into law of a bipartisan bill (S2483/A4126) to keep guns away from domestic abusers. The bill passed by a 61-2 vote in the NJ Assembly and a 32-0 vote in the NJ Senate. Two earlier versions of the bill had been vetoed by Gov. Chris Christie, but he today signed the slightly modified bipartisan version, which CFNJ and other gun violence prevention advocates had also supported. Ceasefire NJ (CFNJ), a Project of the Princeton-based Coalition for Peace Action (CFPA) advocated strongly for this bill, including coordinating statewide lobbying for it. "We applaud Senate Republican Leader Sen. Tom Kean, Jr. and Senate Democratic Leader Sen. Loretta Weinberg for making this a bipartisan effort in the NJ Senate, and we applaud the NJ Assembly that only two members (of a total of eighty) voted against the bill. We especially praise Assemblywoman Gabriella Mosquera, herself from a family that experienced domestic violence, for her outstanding and tenacious leadership. We also applaud Gov. Christie for signing this bipartisan bill into law. This shows that bipartisan cooperation can lead to concrete steps that make the people of New Jersey safer from the scourge of gun violence. Finally, we hail the many grassroots supporters around the state that contacted their NJ legislators in support of this important bipartisan bill. We were pleased to work with groups like Moms Demand Action, which had a visible contingent at the State House to stand with CFNJ and the Unitarian Universalist Legislative Ministry of NJ in advocating for this bill in the NJ Legislature," said the Rev. Robert Moore, executive director of the Coalition for Peace Action, of which CFNJ is a part. Overshadowed by last-minute legislative wrangling over bills to allow Governor Christie to profit from a book, give raises to select staffers and judges and end the mandatory publication of legal ads in newspapers, lawmakers quietly passed other measures on Monday related to concealed carry regulations, ride-sharing services and criminal justice reform. The Assembly completed a multi-step process to block Christie from loosening one of New Jersey's toughest gun-control laws. It was another defeat for Christie in a day full of them. Criticizing New Jersey's gun laws as too restrictive, Christie in May proposed a change in statewide regulations to expand the categories of people who may carry handguns in public." Click here to read full article. The Rev. Robert Moore, spokesman for Ceasefire New Jersey, a gun control advocacy group, said he’s been advised by Assemblywoman Gabrielle Moscera, D-Gloucester, a prime co-sponsor, that Christie plans to sign. “This shows that bipartisan cooperation can lead to concrete steps that make the people of New Jersey safer from the scourge of gun violence,’’ Moore said. Moore said “grassroots supporters around the state’’ made a difference by contacting their district legislators “in support of this important bipartisan bill.’’ Click here to read full article. Ceasefire New Jersey (CFNJ), the state’s leading gun violence prevention group, today hailed passage of A4126, a bipartisan bill to keep guns away from domestic abusers, by a 60-2 vote in the NJ Assembly. The bill had earlier passed by 32-0 in the NJ Senate, where its number was S2483. Two earlier versions of the bill had been vetoed by Gov. Chris Christie, but CFNJ was advised by Assemblywoman Gabrielle Moscera, a prime co-sponsor, that Christie plans to fulfill his pledge to sign this bill. Ceasefire NJ (CFNJ), a Project of the Princeton based Coalition for Peace Action (CFPA) advocated strongly for this bill, including coordinating statewide lobbying for it. "We applaud Senate Republican Leader Sen. Tom Kean, Jr. for joining with Senate Democratic Leader Sen. Loretta Weinberg to make this a bipartisan effort in the NJ Senate, and we applaud the NJ Assembly that only two members (of a total of eighty) voted against the bill today. This shows that bipartisan cooperation can lead to concrete steps that make the people of New Jersey safer from the scourge of gun violence. We also hail the many grassroots supporters around the state that contacted their NJ legislators in support of this important bipartisan bill. We were delighted to work with groups like Moms Demand Action, which had a visible contingent at the State House to stand with CFNJ and others today," said the Rev. Robert Moore, executive director of the Coalition for Peace Action, of which CFNJ is a part. Click here to see a statement on the bill. Gun Violence Prevention Bill Takes Another Key Step Forward and Passes NJ Assembly Appropriations Committee! S.2483/A.4126 Moves to the NJ Assembly Floor Nov. 21 – Advocacy calls and emails needed! Co-led by CFPA’s Ceasefire NJ Project, an intensive lobby effort advocating the NJ Assembly’s Appropriations Committee to support A4126, a bill to remove guns from those in domestic violence situations, culminated with its passage by that Committee on Thursday, October 27. There was concern that after getting unanimous bipartisan support in a previous Senate vote, a major breakthrough, the Assembly Law and Public Safety Committee had approved it 5-3, with one abstention, along party lines. CFPA quickly sent out an Alert to its Ceasefire NJ (CFNJ) contacts urging over 700 on the listserv to contact their members of the Appropriations Committee. CFNJ Legislative Director Dolores Phillips monitored and stayed in close touch with key contacts in the Assembly. CFPA Executive Director Rev. Bob Moore testified in support of the bill on October 27, and there was also a strong presence of Moms Demand Action/Everytown for Gun Safety. The exciting news is that this Committee approved the bill by a 9-1 vote, with 1 abstention. Our goal was to exceed the 2/3 margin it would take to over-ride a possible veto by Gov. Christie. We achieved that, and the floor vote in the Assembly is tentatively scheduled for Monday afternoon, November 21. Watch for updates from our CFNJ Project, and contact your Assemblypersons when you receive them. Those who can come to Trenton on a week day, please pencil in that date on your calendar to come for the vote, and stay tuned for further updates! Please click here to see Bill S.2483 that Ceasefire NJ is working to support in the NJ Legislature. Click here to see latest report on Ceasefire NJ from Legislative Director Dolores Phillips. This weekend the Coalition for Peace Action (CFPA) participated in two Concert Across America events. Click here to see of video of CFPA Executive Director Rev. Bob Moore speaking at Concert Across America in Cherry Hill! Coalition for Peace Action (CFPA) Executive Director Rev. Bob Moore and Ceasefire NJ Legislative Director Dolores Phillips appeared on the TV news program BackStory with Joan Goldstein to discuss gun violence. Click Here to see the video! In several of the most recent high-profile mass shootings in the United States, the gunmen used semiautomatic AR-15 style rifles. Moore said New Jersey’s assault rifle ban in 1990 inspired the federal ban that became law in 1994, which expired 10 years later. New Jersey’s ban is the strongest in the country, he said, primarily because there was no grandfather clause that allowed guns already owned or on the market to still be owned and sold as in the now-expired federal ban. The law prohibits possession of dozens of specific brands and any firearm that is identical to any of them. It outlaws revolving cylinder shotguns, "street sweepers," semiautomatic shotguns with either a magazine capacity exceeding six rounds, a pistol grip, or a folding stock and any semiautomatic rifle with a fixed magazine capacity exceeding 15 rounds. The crux of New Jersey’s ban is the limit on high-capacity magazines, Moore said. Our hearts are broken, and our prayers and condolences go out to the victims of the Orlando mass shooting, the largest in U.S. history. Of the eight such high-profile mass shootings in the past year, starting with Charleston, seven of the shooters used assault weapons. It is the weapon of choice for mass shooters. These weapons of war are designed to kill as many as quickly as possible on the battlefield. It is outrageous and unconscionable that we allow these weapons in our civilian communities. New Jersey passed one of the first assault weapons bans in the nation, and has the strongest ban still today—it’s the only ban with no grandfather clause. The mass shooting in Orlando on Sunday was appalling in scale: 49 killed in a single attack. But it’s not unusual for dozens of Americans to be killed by guns in a single day. TRENTON — State lawmakers on Thursday advanced an effort by Democrats to block Gov. Chris Christie's proposed changes to regulations concerning handgun carry permits in New Jersey. A state Assembly committee approved two pieces of legislation intended to fight the governor's attempt to loosen the state's tight restrictions on such permits. The committee advanced a resolution (ACR 175) already approved by the state Senate that would effectively reverse recently announced changes to the State Police permitting process. The Rev. Robert Moore, executive director of the Coalition for Peace Action, said the governor's support for broadening access to carry permits was based on "a Wild West fantasy that the good guys will always shoot the bad guys and knock them dead." But this idea is grounded in wild west fantasies like those on 1950’s television shows, and doesn’t hold up to common sense and thoughtful scrutiny. As of 2013, there were 357 million guns possessed by 317 million Americans, the most guns per capita of any country in the world. Yet the US has a higher rate of gun deaths than any other industrialized country, about 33,000 per year. For the first time last year, gun deaths were higher than fatalities from auto accidents. But less than 1% of gun deaths in the US are classified as justifiable shootings for self-defense. The idea that “good guys” could prevent a lot of gun deaths if enough were armed contradicts factual analysis and common sense. During a single week in April, four preschoolers shot and killed themselves and another killed a mother. Such shootings now average two per week. Clearly, the widespread availability of guns—especially those that are not locked up—can result in catastrophe. When we consider the specific ways that the presence of guns played out in a number of real situations, it shows that they didn’t protect the people. At a 2012 shooting at the Empire State Building, two highly trained police officers shot 16 rounds at the perpetrator. While he was killed, nine innocent bystanders were also hit. A mental exercise I suggest is imagining what might have happened if there were armed people in the audience at the mass shooting at the Aurora, CO theater. Numerous people shooting in a darkened theater filled with tear gas would probably have resulted in a far worse massacre than the one that occurred. Nationally, there is a strong association between a state’s gun safety laws and the rate of gun violence. States with stronger gun safety laws have lower rates of gun violence. New Jersey ranks second or third on the strength of its gun safety laws, and has the sixth lowest per capita rate of gun violence in the country. Alternatively, a public health approach akin to the mandating seat belts and air bags for cars, resulting in cutting annual deaths from auto accidents by nearly 50%, could be pursued. Handguns could have “childproof” technology mandated that enables only the legal buyer of the gun to fire it. The preschoolers mentioned above would still be alive if such laws were in effect. The Ceasefire NJ Project of the Coalition for Peace Action has educated and advocated for effective gun violence prevention measures for over two decades. We invite interested readers to learn more by clicking the Ceasefire NJ icon at peacecoalition.org or by calling 609-924-5022. It has just been brought to my attention that the deadline to submit a comment on Gov. Christie's proposed new rule to make it easier to get a permit to carry a firearm in NJ is this Friday, May 6! To date, no Public hearing has been scheduled for facilitating comments, as is the custom. Everyone receiving this Alert is urged to send a Comment by May 6, and to include a request for public hearings! Senate Majority Leader Loretta Weinberg, D-Teaneck, said the changes proposed would “significantly expand” the eligibility requirements for who is allowed to carry a conceal weapon. “To put it simply, if these regulations were adopted, it would allow every cab driver, every pizza delivery driver, every Uber driver and any one else living or working in a high crime neighborhood to qualify for a firearms permit,” Weinberg said at a new conference at the State House. As we've been planning for some time, a Statewide Planning and Coordination Meeting for Gun Violence Prevention Work across New Jersey will take place as indicated below. If you didn't previously, please reply to this email to indicate whether you plan to attend! Also, kudos to the Monroe Township Chapter of the Coalition for Peace Action, at an April 20 gathering with Sen. Linda Greenstein for recentlygenerating nearly 25 letters to Gov. Christieurging him to sign the Weinberg/Mosquera Domestic Violence/Guns Bill Passes Both Houses (S.805/A.1211) (see second item down on the link for more info)which reently passed both houses of the legislature and is on the Governor's desk! c) requires cross-referencing of records to assist in determining whether the alleged attacker owns a firearm and in removing those firearms. On Thursday, April 8th, S.805/A.1211 passed out of the Assembly with a vote of 50-17-6-7. (6 abstentions and 7 not voting - not present). Several Democrats were missing and we held onto the three Republicans we had in January, Asm. Ciattarelli (R-16), Asw. Handlin (R-13), and Asm. Chris A. Brown (R-2). Most of the session day was taken up with the Atlantic City debacle and fight between the Speaker, Senate President and Governor, - the politics of this will undoubtedly effect every controversial bill including S.805. The roll call vote is embedded further down, underneath the Governor's press release. The Governor has the bill and has 45 days to take action from 4/8/16. Subsequent to receiving the Weinberg/Mosquera bill, the Governor issued new rules at 5 pm on Friday 4/9/ These rules change gun permitting and expediting through the Attorney General's office via the rulemaking process. Anyone can publicly comment on the rule. See the press release below. Strategy: Action needed: organizations to send organizational letters of support for the bill directly to the Governor's office. Of great value are "Letters to the Editor" to local and state-wide papers to begin the public debate again on this bill and a possible override. Suggest those that are in these readership areas write to the: Courier Post, Star Ledger, Trenton Times, Asbury Park Press, Bergen Record, Daily Record, and Atlantic City Press. Be prepared for another conditional veto considering the Governor's Friday action. Time line for letters: by April 15th, before we lose momentum. Additional note: S.816, the smart gun (childproof handgun bill), at this point it is stalled in the Assembly Law and Public Safety Committee. The Assembly version has not moved, and the Chairman of the Assembly Law and Public Safety Committee must post the S.816 for a vote. So far in 2016, two important bills have already passed the Senate Law and Public Safety (LPS) Committee and floor, and are now stalled in the Assembly LPS Committee. We need members of the Assembly to co-sponsor both of the Assembly versions of these bills, ASAP. More importantly, Assembly members need to write to the Committee Chairman Benson, and to Speaker Prieto. 3/14/16 to Assembly LPS Committee, but has not been heard. Why bill is important: Closes a loophole - protecting victims of domestic violence who live in households with guns. Passed the Senate LPS Committee 3-2-0 down party lines on 2/4/16. Passed Senate Floor 2/11/16 21-13-6. Bill Referred to the Assembly LPS Committee, but has not been heard. Why important: Repeals original law, P.L. 2002, C.130, s.5 / N.J.S. 2C:39-1 and 58.2 et seq. Point of repeal by the original sponsor (Weinberg) is to make the bill more operative and to stimulate the R&D and sales of smart handguns, which has stopped. Senator Weinberg was interviewed on 60 Minutes on this bill in the Fall. After President Obama issued his Gun Violence Prevention Ultimatum and Executive Orders (after San Bernadino), Assemblyman Johnson immediately went to the Speaker and asked him to post for a floor vote, Senator Weinberg's bill, S.3249. The bill passed the floor, but was pocket vetoed by the Governor. Specific legislative targets will be worked on during the next week. S.1165 (Madden/Greenstein) - Closes a loophole in the State Implementation of the Brad Law for those leaving out of state applying to gun permits, but previously involuntary committed in NJ. Bill has passed committee, and has been referred to the Senate Budget and Appropriations Committee. S.172 (Bateman/Smith) - Adds convicted crimes which prevent gun possession. Bill passed Senate LPS committee and now in the Senate Budget and Appropriations Committee. Below see the update I received this morning from Ceasefire NJ Legislative Director Dolores Phillips. I wanted you to see this important information ASAP! The NJ Legislature has now begun it's 217th Legislative Session and the first Committee Meetings are being held this week. This Thursday, January 28th at 10:30 AM The Senate Law & Public Safety Committee is Meeting and voting on two gun violence prevention bills pocket vetoed by Governor Christie on Jan. 19th. Testimony will be taken. Yes, we start all over again with the bills. State House Annex Room 6 First Floor. S.172 (Bateman) (R-16) re-introduction of Criminalizing to the 2nd degree possession of a firearm if one has been convicted of carjacking, racketeering, gang criminality, or terrorist threats. Click here and enter bill number to see the bills. Dolores Phillips will be testifying in favor of these two bills at the committee hearing. We urge others to attend or send letters of support. Princeton, NJ - Governor Christie's pocket veto of two gun violence prevention bills today resulted in activists calling on the Governor to put his priorities straight and protect New Jersey citizens first and New Hampshire primary voters last. Dolores Phillips, Legislative Director of CEASEFIRE-NJ, stated that "Governor Christie should be ashamed of invoking the pocket veto on two gun violence prevention measures that would of benefited public safety. Over the last six months the Governor has turned to the right politically and vetoed several pieces of legislation that would of helped to stem gun violence in NJ. Perhaps it is time for the Governor to resign and move to New Hampshire since his decision's are influenced by attempting to win the minds of New Hampshire primary voters, while compromising the safety of New Jersey citizens. He has not signed or promoted one piece of gun violence prevention legislation since he announced his campaign for president". The two pieces of legislation, S.3249/A.4717 (Weinberg, Codey/Johnson) and A.4182/S.1995 (Eustace/Bateman) addressed child-proof guns (smart gun technology) and forbidding firearm possession by those convicted of certain crimes including carjacking, racketeering, and terrorist threats. Phillips added "These bills were small changes in law, common sense measures, that would of enhanced public safety and health. The individual career path of a Governor should not compromise public health. This is what the Governor has done and should be shamed out of politics entirely". CEASEFIRE-NJ is the state's oldest and largest gun violence prevention organization. It is a campaign of the Princeton based Coalition for Peace Action. Also responding positively to Mr. Obama’s initiatives was Princeton-based Ceasefire NJ , New Jersey’s oldest and largest gun violence prevention group. We invited two New Jersey activists on opposing sides of the gun debate to tell us how they think the president's order would impact law-abiding gun owners in the state. We spoke to Rev. Robert Moore, executive director of Princeton-based Coalition for Peace Action , which is affiliated with CeasefireNJ. On the other side, we spoke to Alexander Roubian, president of the New Jersey 2nd Amendment Society. I applaud President Obama for taking concrete action to reduce the epidemic of gun violence in America ("A tearful Obama acts on guns," Wednesday). His executive actions will make a significant contribution to reducing the estimated 40 percent of gun sales that don't involve background checks - especially at gun shows and online. I'm also pleased that the president is adding federal resources to improve gun safety technology (smart guns), the kind of public-health approach that dramatically reduced deaths from auto accidents. Ceasefire NJ was proud to spearhead the country's first childproof-handgun bill in 2002, but its implementation has been stymied by the National Rifle Association. The president's measures may finally help it come into existence. I applaud him for not scapegoating mentally ill people for gun violence but instead devoting an additional $500 million to treat such people. Finally, I applaud incorporating more data, including from the Social Security Administration, to prevent those with disabling mental illnesses from buying guns. For more information, go to peacecoalition.org or call 609-924-5022. President Obama shed tears on Tuesday as he called for new gun safety measures, and some critics perceived weakness or wimpishness. Really? On the contrary, we should all be in tears that 225,000 Americans have already died of gun violence in his seven years in office. The shame is not a president weeping a bit, but that he has not been able to prevent roughly as many people dying of guns in America on his watch as have been killed in the Syrian civil war (where estimates range from fewer than 200,000 to more than 300,000). Yes, the American gun toll includes suicides and, yes, Syria is a smaller country, but it’s worth a cry that a “peaceful” America during Obama’s tenure has lost roughly as many lives to gunfire as Syria has in civil war. Coalition executive director the Rev. Robert Moore said he wants Obama’s decision to not only stay in place but to serve as a foundation for more tightening of access to firearms.On the other side are gun control advocates, including Ceasefire NJ, an arm of the Princeton group Coalition for Peace Action. January 5, 2016- The President announced new executive actions to reduce gun violence and make our communities safer. Please see this fact sheet, which can also be accessed by clicking the image below, for additional details on these executive actions. TRENTON —Chris Christie's call to broaden access to gun permits in New Jersey may be getting mixed reviews at home, but it appears to have given his presidential campaign a boost in New Hampshire. A day after the head of the New Jersey Second Amendment Society predicted Christie would be "booed and kicked out" of New Hampshire for not fighting harder to overturn concealed carry restrictions he saw as unconstitutional, another Garden State gun rights group's chief published an editorial in New Hampshire's largest newspaper lionizing the governor. TRENTON – New Jersey’s strict gun-carrying laws would become more permissive, if recommendations of a study commission appointed by Gov. Chris Christie are implemented. The 34-page report by the Firearm Purchase and Permitting Study Commission, created by Christie the night before he announced his presidential bid June 30, recommends changes aimed at easing restrictions in three areas of the state’s gun law. Dolores Phillips, legislative director for Ceasefire New Jersey, said Christie is out-of-step with state residents’ support for strict gun control and trying to cozy up to the National Rifle Association and Republican presidential primary voters. Prior to his presidential run, Christie touted the state’s strict gun controls; as a candidate, however, he had retreated from those measures. ACT NOW to Prevent Gun Violence by over-riding Gov. Christie's veto! CFPA's Ceasefire NJ Project played a leading role in the October 22 NJ Senate vote to over-ride Gov. Christie's veto of S2360, which would put more checks on people with serious mental illness history having the ability to buy guns restored. We are half way there, after 52 failed attempts, to over-riding a veto by Gov. Christie! Thursday, December 17, the NJ Assembly will vote for the second time on the over-ride . Just three more Republican Assemblypersons are needed to successfully complete the over-ride. If that also succeeds at getting a 2/3 majority, it will be a major victory for gun violence prevention! Click to see the excellent Trenton Times editorial supporting the over-ride. S2360 was requested by the NJ Judiciary, and passed unanimiously in both Houses of the NJ Legislature! See the history of the bill and the over-ride effort here . To succeed in the NJ Assembly, we need your active advocacy NOW! Second, come to the cafeteria of the NJ State House at 11 AM this Thursday, December 17 to help with last minute face to face lobbying before the 1:00 PM vote. If you want to carpool from Princeton, meet at 10:15 AM at the Rite Aid end of the Princeton Shopping Center. If you can come only for your lunch hour, we urge you to come and lend your active support! Third, click here and scroll to the bottom to vote yes in the online poll about support for the over-ride. Elected officials pay attention to polls! We are within three votes of getting to the 2/3 majority needed! MAKE YOUR CALL OR EMAIL YOUR TWO NJ ASSEMBLYPERSONS NOW! Assembly override Christie on gun-control veto? TRENTON - In the aftermath of another mass shooting, this time in California, the state Assembly votes Thursday on whether to override Gov. Chris Christie’s veto of a gun-control measure. An Assembly override, however, is no sure thing. Though the bill passed 39-0 in the Senate in March and 74-0 in the Assembly in June, Christie rewrote it into a broader mental-health reform. It took two votes for the Senate to override, with three Republicans in October joining all 24 Democrats to defeat a Christie veto for the first time in almost six years. “I think it’s going to be close, at this point,” said Dolores Phillips, legislative director of Ceasefire New Jersey. Democrats found welcome support from three of their GOP colleagues in the state Senate last month to help them override the governor's veto of an important piece of gun-safety legislation. Now we're about to see if their counterparts in the Assembly can muster the political will to follow suit. A vote is scheduled Thursday on the future of a bill requiring that police be notified when people seeking a gun permit ask a judge to expunge from their record information about their commitment to a psychiatric hospital. CFPA's Ceasefire NJ Project played a leading role in the October 22 NJ Senate vote to over-ride Gov. Christie's veto of S2360, which would put more checks on people with serious mental illness history having the ability to buy guns restored. On December 3, the NJ Assembly has scheduled an over-ride attempt . If that also succeeds at getting a 2/3 majority, it will be the first time, after 52 attempts, that a veto by Gov. Christie will be over-ridden. We are within six votes of getting to the 2/3 majority needed! MAKE YOUR CALL OR EMAIL YOUR TWO NJ ASSEMBLYPERSONS NOW! It's hard to know whether Sen. Loretta Weinberg (D-Bergen) is waving a white flag or playing rope-a-dope, but she made the right call in shelving the Childproof Handgun Act, on the remote chance that she can get smart guns onto the market and save lives. Senate Republican Leader Tom Kean Jr. last week unveiled a so-called “compromise” plan designed to bridge the gap between a gun-control measure that enjoyed unanimous support from the Legislature and Gov. Chris Christie’s conditional veto of that measure. It’s not a compromise. It’s nothing more than a Republican cover story attempting to justify the veto and GOP lawmakers’ refusal to override it. Senate president Steve Sweeney, having exhausted conventional parliamentary methods, is now trying vote-shaming. He stood at a podium Monday in Princeton, squarely in the footprint of a recalcitrant legislator – one who authored a bill that helps keep firearms away from the mentally ill, only to bail out after the governor vetoed it –and double-dared that Senator to do it again. This map from Mass Shooting Tracker, a database that tracks shootings since 2013, shows there have been at least 986 mass shootings, with shooters killing at least 1,234 people and wounding 3,565 more, since the Sandy Hook Elementary School shooting in Newtown, CT until most recently the October 1, 2015 UCC School Shooting in Oregon. PULASKI, Va. — In May 2009, Sam French hit bottom, once again. A relative found him face down in his carport “talking gibberish,” according to court records. He later told medical personnel that he had been conversing with a bear in his backyard and hearing voices. His family figured he had gone off his medication for bipolar disorder, and a judge ordered him involuntarily committed — the fourth time in five years he had been hospitalized by court order. When Mr. French’s daughter discovered that her father’s commitment meant it was illegal for him to have firearms, she and her husband removed his cache of 15 long guns and three handguns, and kept them after Mr. French was released in January 2010 on a new regime of mood-stabilizing drugs. October 4, 2015 The Bergen Record By Brigid Harrison Christie put pressure on Republican state senators to defy their consciences and their constituents and reverse their positions. And, predictably, nearly all of them did. Click Here for the Bishop's Statement on S2360, (released on September 24 at CFPA's Press Conference the day of the override veto vote), the bill that would require local, county, and state law enforcement officers to be alerted when people with a history of serious mental illness try to expunge their mental illness records so they can buy a gun. Certain mental illnesses prohibit New Jerseyans from acquiring a gun permit, as is the case in dozens of other states. A court can expunge the record of psychiatric treatment to make someone eligible for a permit, however, so judges have asked for help with such decisions, and our legislature tried to give it to them last March: In a vote that passed both houses without dissent, lawmakers proposed a bill that requires police to notify the court of pending charges, criminal history and behavior before the record is cleansed. But Gov. Christie vetoed the bill in August, and all but two of the Republican legislators who originally voted for it curled up in fetal position last week, when it came time to override. That's 52 unsuccessful overrides, if you're keeping score at home. THE STATE Senate failed once again last week to override a veto from Governor Christie, this time on a gun-control measure, despite bipartisan support for the initial passage. Aside from the two Republicans who stood by their original stance, it was another case of cowardice in governing. So what’s the excuse this time? Once again, New Jersey’s Republican legislators have meekly bowed to their master, Gov. Chris Christie, to avert an override of a Christie veto. This time, it was the GOP senators turning tail on a gun bill that no one had opposed when it was originally approved. The bill requires that law enforcement be informed when a prospective gun buyer seeks to expunge mental health records. The state Senate failed Thursday to override Gov. Chris Christie's veto of a bill that would have included local law enforcement officers in the process of deciding whether a person with a documented mental illness could apply for a gun permit. But state Senate President Stephen Sweeney (D-Gloucester) did not let the bill go down to defeat. He refused to close out the voting and pulled the item from consideration. A firearms bill that had passed the Legislature without opposition was put into legislative limbo Thursday after Republicans balked at an attempt to override Gov. Chris Chrisite’s veto of it. The bill would make it harder for people seeking gun permits to expunge their mental health records. Action Needed Immediately to Reduce Gun Violence in NJ! Building on the advocacy by CFPA's Ceasefire NJ Project (see CFNJ representatives testifying to NJ Senate Committee above), A4218, the bill for guns to be removed from those with restraining orders passed both Houses of the NJ Legislature late afternoon on June 25. Passage was by strong majorities: in the NJ Assembly, which voted first, it was 49 yes, 11 no, and 19 abstentions. In the NJ Senate, it was 29 yes, 1 no, and 10 abstentions. NJ Gov Chris Christie's may have to make a decision as soon as Thursday, August 13:to sign, veto, or conditionally veto. It is urgent that NJ residents let him know we, his constituents, want him to sign it into law! We urge all NJ supporters to call (609) 292-6000 and/or click here to send an email demanding that he sign the domestic gun violence prevention bill; no veto or conditional veto! Three weeks after Governor Christie said, in a late-night email on the eve of his presidential campaign, that he would propose “common-sense” changes to New Jersey’s gun regulations, no plan has been put forward. Christie’s decision was met with a mix of praise and criticism — in some cases from the same people. While the governor announced he would make the regulatory change, he did not sign legislation on his desk that would close a loophole in the state’s gun law requiring domestic violence offenders and those with restraining orders against them to give up all their firearms. Bill sponsors and critics of the Republican governor expressed disappointment, and some said it served as an example of how Christie is trying to appeal to a conservative base. “It looks to me like he’s playing [to] a particular audience,” said Dolores Phillips, legislative director of the advocacy group Ceasefire NJ. Late June 29th, a press release appeared on the Governor's official website announcing two initiatives on gun regulation. Touted in the release as a solution to gun violence in domestic violence situations, the Governor ordered fast-tracking gun permitting and signed an executive order to create a study commission. The Governor has since spoke to the national press about fast-tracking of gun permitting while his office deleted press release from his website. Neither of these initiatives makes any sense and are diversionary tactics to disguise and delay the issue at hand: the Governor's decision on legislation sitting on his desk to close a gun possession loophole by mandating removal of guns from those with restraining orders against them. National data contravene policies to arm everyone and put more guns on the streets. Only 250 (less than 1%) of the 33,000 deaths from guns are ruled as justifiable homicide. Expediting gun permitting and telling women in domestic violence situations to arm themselves is bad policy. We call on the Governor to sign this important legislation immediately (A.4218), without any changes. Those who desire more information can contact the Ceasefire NJ Project at (609) 924-5022 or www.peacecoalition.org. Domestic Gun Violence Prevention Bill Passes! Urge Gov. Chris Christie to Sign It! Building on the advocacy by CFPA's Ceasefire NJ Project (see CFNJ representatives testifying to NJ Senate Committee above), I'm delighted to share that the bill for guns to be removed from those with restraining orders passed both Houses of the NJ Legislature late afternoon on June 25. The bill now goes to Gov Chris Christie's desk, and we need to let him know we, his constituents, want him to sign it into law! We urge all NJ supporters to call (609) 292-6000 and/or click here to send an email demanding that he sign the domestic gun violence prevention bill; no veto or conditional veto! Critics see politics behind Christie’s move to ease gun permits for domestic-abuse victims and lack of action on bill to stop abusers from getting guns. Gun rights advocates and domestic violence activists both see what Governor Christie did Monday night to New Jersey’s firearms regulations as a common-sense step to help victims of abuse. But that’s where the agreement ends and the suspicion starts. In a late-night announcement on the eve of his candidacy for the White House, Christie moved to loosen regulations and expedite reviews of gun permits sought by domestic violence victims. But while that would hasten a victim’s ability to get a gun, a bill that would take away guns from domestic violence offenders sat unsigned on his desk. Representatives of the Ceasefire NJ Project of the Coalition for Peace Action testified for the Domestic Violence/Guns Bill at the NJ Senate Law & Public Safety Committee at the NJ State House in Trenton on June 11, 2015. Pictured left to right at front: Dolores Phillips, Legislative Director, Ceasefire NJ Project; The Rev. Bob Moore, Executive Director, Coalition for Peace Action; Kip Cherry, Co-chair Political Action Committee for Coalition for Peace Action. HELP STOP DOMESTIC GUN VIOLENCE! YOUR ACTION NOW and ON THURSDAY CAN MAKE A DIFFERENCE! Whether or not you can come to Trenton on Thursday, Email letters and calls of support any member that resides in any of the following districts of the committee members. CONTACT YOUR NEW JERSEY STATE SENATOR Tuesday and Wednesday. Click the link on the left and telephone and send email to YOUR Senator! Urge them to vote YES on S.2786! For a summary of S.2786, which would close a loophole and require those who have a restraining order to turn in any guns they possess, click here. Call or email the members below before Thursday to urge them to support S. 2786! If you are the legislative rep or leader for a grassroots organization, Formal letters on letterhead need to get out to them ASAP. to be prepared to testify publicly if you are a constituent, or represent an organization, or are a specific victim. RSVP as below for Carpooling from Princeton Shopping Center, 301 N. Harrison (Rite Aid end) at 9:00 AM. Meet at the State House Cafeteria at 9:45 AM so that we can coordinate and be upstairs on the 3rd floor in the right locations by 10 AM. The domestic violence and firearms bill, A4218, was scheduled to be heard on Monday, June 1, in Assembly Law and Public Safety. The Coalition for Peace Action's Ceasefire NJ Project joins Congresswoman Bonnie Watson Coleman for a Press Conference to Launch Legislation to Reduce Unchecked Online Ammunition Purchases in Trenton, NJ on May 11, 2015. The Rev. Bob Moore, Coalition for Peace Action (CFPA) Executive Director, speaks on behalf of CFPA's Ceasefire NJ Project. From left: Mayor of Trenton, Eric E. Jackson; The Rev. Darrell Armstrong, Shiloh Baptist Church in Trenton; Congressman Frank Pallone Jr.; The Rev. Bob Moore, Coalition for Peace Action Executive Director; Councilwoman Phyllis Holly-Ward, Councilman Duncan Harrison Jr.; Councilwoman Marge Caldwell-Wilson; and Congresswoman Bonnie Watson Coleman at the podium addressing the press. To view a complete photo gallery of the Press Conference, (pictures courtesy of Irene Goldman), please Click Here. Ewing, NJ (Monday, May 11, 2015) ― At a press conference today in the Serenity Garden in Trenton, Rep, Bonnie Watson Coleman announced plans to introduce the Stop Online Ammunition Sales Act of 2015, legislation that would place limits and safeguards on the online market for ammunition. "As a long time leader in gun violence prevention, our Ceasefire NJ Project has overcome the resistance of the NRA to other common sense laws such as New Jersey's Assault Weapons Ban, limiting handgun purchases to one per month, and the Childproof Handgun Bill,” said. Rev. Robert Moore, Executive Director of the Coalition for Peace Action. “ We are committed to join with Rep. Watson Coleman and others in fighting for this important new gun safety measure." The Stop Online Ammunition Sales Act of 2015 would require federally licensed ammunitions dealers to confirm the identity of individuals who arrange to purchase ammunition over the internet by verifying a photo I.D. in-person. The bill would also require ammunition vendors to report any sales of more than 1,000 rounds within five consecutive days to the U.S. Attorney General, if the person purchasing ammunition is not a licensed dealer. The bill has been endorsed by the Brady Campaign to End Gun Violence and its nationwide network of chapters, and the Newtown Action Alliance. To see the text of the bill, click here. Send Emails to Elected Officials to Close Deadly Loopholes in NJ Gun Laws! Click here to send a message to your representatives in the New Jersey State House. Tell them to keep guns out of dangerous hands by passing comprehensive background checks legislation! The following images are being shared by the Center for American Progress, who are starting a nationwide push in support of Dr. Vivek Murthy, nominated for Surgeon General. Dr. Murthy's confirmation has been opposed by the NRA and gun lobby, and national groups are organizing in response. Please utilize and share the following on all Social Media forums, and call the number below to urge your senators to confirm President Obama's nominee, Dr. Vivek Murthy, for Surgeon General. Newtown gun control advocates protest Chris Christie’s Connecticut tripAbout 150 protesters - including several dozen from Newtown, Conn. site of the 2012 mass shooting at Sandy Hook Elementary School - gathered on a quiet street in Greenwich where New Jersey Gov. Chris Christie was attending a fund raiser for Republican gubernatorial hopeful Tom Foley. The protesters were there to speak out against Christie’s veto of a bill that would have limited gun magazines to ten rounds. Click here to see a web page of the July 14, 2014 Urgent Alert responding to Gov. Christie's veto of the 10 bullet limit on ammunition magazines. Also see the Alert pasted below. Act NOW to strongly oppose Gov. Christie's veto of the bill for a 10 bullet gun magazine limit! Both houses of the NJ legislature approved this common sense measure to reduce the death and destruction of mass shootings by forcing shooters to re-load more often. We must not let this go by without expressing our strong democratic dissent! Here is an update sent on July 14 Nicola Bocour, the Legislative Director of the Coalition for Peace Action's Ceasefire NJ Project. Below that is an Alert posted on July 11. Governor Christie's veto has continued to stay in the news, with incredible op-eds by a Newtown parent Hugo Rojas , whose son escaped when the shooter paused, and CT Governor Dan Malloy in the Star-Ledger this weekend. Additionally, two former NJ governors, Gov Byrne (D) and Gov Kean (R), openly disagreed with Christie's veto in aQ&A session published this morning. Please help us to share these comments and continue to build wide support for this measure! Below is an Alert from Nicola Bocour, the Legislative Director of the Coalition for Peace Action's Ceasefire NJ Project. Please take action ASAP! Right before the July 4th holiday weekend, Governor Christie vetoed A2006 - the bill to limit the number of rounds in a magazine to 10. Governor Christie's actions came less than one hour after family members of two Sandy Hook Elementary school children who died in the December 14, 2012 shooting had left the building. The family members had travelled to the State House and delivered more than 55,000 messages from supporters of A2006. Governor Christie attempted to use a common gun lobby tactic and distract the public and media from his cowardly veto by changing the subject-matter of the legislation away from guns. Thankfully, he has been unsuccessful in his attempt to mislead the public. Governor Christie's veto was made even more shameful by his offensive summarization of the legislation, calling the safety measure "trivial" and accusing supporters, including the Sandy Hook families, of "grandstanding." The Sandy Hook Promise response to Governor Christie's veto can be found here. And Majority Leader (and bill-sponsor) Lou Greenwald's response is here. This week Governor Christie defended his veto with some illogical and offensive arguments straight out of the NRA-playbook. He also defended his cowardly decision not to meet with the Sandy Hook families. His defense was met with great criticism by the public and the media. Rachel Maddow called out Governor Christie's 'shameful' actions on her show Monday night. She pointed out, "He's arguing that since we can’t save everyone, he’s not inclined to try to save anyone." The following morning, former Republican congressman and co-host of Morning Joe, Joe Scarborough slammed Christieand called his defense of the veto one of the "stupidest arguments" he has ever heard. All of the New Jersey newspapers have been covering the veto. In particular, the Star-Ledger's Matt Arco has written multiple articles on it and the S-L Editorial Board also called it "a shameful-moment" for New Jersey. And Majority Leader Lou Greenwald had a fantastic op-ed that has been published by multiple outlets. The people of New Jersey, who overwhelmingly support commonsense gun reforms such as this, deserve to know where Governor Christie truly stands on this issue. The question now is: Does Governor Christie support ANY limits on magazine capacity? "Do you support ANY limits on magazine capacity, and if so, what number of rounds do you support as the limit?" You can call the Governor's office at (609) 292-6000 and tweet him (see graphic at top of this Alert) at @GovChristie. Ceasefire NJ spearheaded passage of New Jersey's Childproof, or "smart gun" legislation in 2002. To be implemented, such a gun had to become commercially available. See the May 9, 2014 Washington Post Editorial below advocating its implementation now. MORE THAN a decade ago, New Jersey mandated that handgun merchants switch to selling personalized “smart” handguns once the technology became viable. The effort to make firearms safer for gun owners and their families now has provoked a nasty and dangerous crusade to keep the guns off the market. New Jersey’s lawmakers are thinking about lifting the mandate , with the idea that doing so would blunt the opposition that has cohered around smart guns and ease their entry into the market. Once more consumers know about, experience and trust the technology, the thinking goes, more of them will choose products with simple electronic safeguards against unauthorized use. The number of suicides, accidents and other tragedies, which kill thousands every year, would drop. The more smart guns that take the place of old, unsafe and outdated firearms the better. Because there is no technological reason that smart guns aren’t already available for sale, New Jersey lawmakers should try to deem the mandate already enforceable. Doing so would take the pressure off individual stores interested in carrying the smart-gun products, and it would promote the rapid introduction of the technology into a big state. The government has a long record of mandating basic safety controls on dangerous products, as with seat belts and air bags in cars, often in the face of overblown warnings about their drawbacks. Applying this logic to guns does not insult the Second Amendment or gun owners; it minimizes the dangers associated with an armed populace. The gun lobby would like to treat those dangers and the deaths that result as inevitable or unworthy of serious response. They are neither. Leading gun violence prevention group in NJ is thankful that all residents, shoppers, employees, and law enforcement in Paramus are safe after gunman fires shots inside Garden State Plaza; disappointed by Governor Christie’s inaction regarding this distressing threat to public safety. Ceasefire NJ, the leading gun violence prevention group in NJ and a Project of the Princeton-based Coalition for Peace Action, is thankful that all residents, shoppers, employees, and law enforcement in Paramus are safe today after a gunman opened fire inside Garden State Plaza Mall. We, like so many, hoped and prayed for the safety of all and are glad that New Jersey did not suffer any more injury or loss of life. Special thanks to our colleagues at Bergen County Coalition to Prevent Gun Violence for the update below! Over the summer of 2013, the Bergen County Coalition to Prevent Gun Violence carefully monitored the progress of anti-gun violence legislation. Senate Bill No. 2723, which we deemed to be the most important, sought to create a new regulatory system to link all firearms permits and records regarding gun ownership into a digital card. The governor claims the technology isn’t ready. Conditionally vetoed (sent back to be revised). Assembly Bill No. 3797, which deals with reporting by the State Police to the U.S. Bureau of Alcohol, Tobacco and Firearms. The governor claims the bill needs to be modified to comport with Federal Law. Conditionally vetoed. Assembly Bill No. 3659, which would have revised the definition of "destructive device" to include weapons of .50 caliber or greater, or any weapon capable of attaining a muzzle energy of 12,000 foot/pounds. Vetoed. We cannot and must not give up on the bills Governor Christie vetoed. We must also continue to work in partnership with groups throughout the state to find and support common sense measures to prevent gun violence in New Jersey and also on the federal level. We urge you to vote only for candidates who support stronger anti-gun violence legislation. To that end, we are preparing a short questionnaire to present to all candidates for NJ Senate and Assembly. We will share the results with you as soon as we can. While we wait for the outcomes of the state elections, please contact your current legislators and urge them to support the strongest anti-gun violence legislation possible. The opposition is loud, but we are very much in the majority. Governor Christie's signature on ten gun violence prevention bills this afternoon is certainly a step in the right direction, but, make no mistake, it is only a step. In order to truly protect the lives, homes, schools and neighborhoods of the Garden State he must complete the task before him and sign the remaining gun violence prevention bills on his desk. These include S2723 an omnibus bill that would modernize the state's critical gun purchase structure without trampling on law abiding gun owners' Second Amendment rights. It would also require gun purchasers and owners to undergo firearms safety training, much as we require driver safety training. And, this bill has provisions that will make it far less likely that any New Jersey family will suffer the devastating loss of a child due to careless gun storage, as happened recently in Toms River. The Governor has been increasingly outspoken lately about homeland security, a subject especially near and dear to New Jerseyan's hearts. In this interest he, thankfully, signed today legislation prohibiting gun sales to individuals on the federal Terrorist Watch List, but it is not enough. He has yet to act on a bill, A3659, on which he is on record calling for enactment, to prohibit sales of incredibly destructive .50 Caliber sniper rifles. These military weapons are designed to destroy at great distance the sort of material targets that abound in our state, such as chemical plants, refineries, rail tank cars and passenger aircraft. Taking the Governor's words to US Senator Rand Paul at face value, it is confusing that A3659 remains unsigned. Finally, in order for policy makers and the public to make wise public safety decisions, they need all available information. The Governor has taken no action yet on A3797, a bill that would make crucial information, that legislators, municipal officials and the citizenry cannot now see, public on illegal gun flows, enabling the creation and maintenance of well targeted public safety policies. Therefore, New Jerseyans for Safety from Gun Violence stands with the vast majority of Garden State residents in calling on the Governor to finish his work by signing the remaining bills at once – for safety's sake. Click here for an excellent update on gun violence since Newtown from Bill Moyers' web page. "Senators Quietly Seek New Path on Gun Control,"
WASHINGTON — Talks to revive gun control legislation are quietly under way on Capitol Hill as a bipartisan group of senators seeks a way to bridge the differences that led to last week’s collapse of the most serious effort to overhaul the country’s gun laws in 20 years. Drawing on the lessons from battles in the 1980s and ’90s over the Brady Bill, which failed in Congress several times before ultimately passing, gun control supporters believe they can prevail by working on a two-pronged strategy. First, they are identifying senators who might be willing to change their votes and support a background check system with fewer loopholes. CFPA's Ceasefire NJ Project Director, Nicola Bocour (second from right) meets with Assembly Majority Leader Lou Greenwald (second from left), primary sponsor of gun violence prevention legislation in the New Jersey Assembly. Some 22 bills, including the ones Assemblyman Greenwald sponsored, were passed on February 21. "Do Gun Buybacks Reduce Gun Violence?" State officials, with the help of local authorities, have been conducting a gun buyback campaign in several New Jersey cities, an effort to reduce gun-related crimes that they say was planned before the Newtown, CT, shooting. Since December, the state has spent $1.2 million on five buybacks. They’ve collected a record haul of more than 9,000 firearms, including rocket launchers, assault weapons, and submachine guns. Nicola Bocour, director of Ceasefire New Jersey, said the focus should be on the legislation. “That’s the most effective way to deal with this issue,” she said. The Assembly approved a multibill package on February 21 that would require all ammunition sales to be conducted by licensed dealers on a face-to-face basis, banning mail order sales; limit magazine capacity to 10 rounds; and prohibiting the state pension system from investing in companies that manufacture or import assault weapons for civilian use. The bills have been sent to the Senate and have not been assigned to a committee. She said that Ceasefire is not opposed to buyback programs -- they help create awareness of the issues surrounding guns -- but there is a concern that focusing on buybacks could ultimately be deceptive, creating an impression that something is being done when it is not. "New Jersey Assembly Panel Backs Tougher Gun Laws"
Ceasefire NJ, the state’s leading gun violence prevention organization, was pleased to hear Governor Chris Christie cite New Jersey’s strong gun laws as one of the areas in which NJ has been successful in addressing the issue of gun violence. We agree with the Governor that NJ has some of the strongest gun laws in the nation and are, like him, very proud of that fact and believe that our laws have made this state safer. The Governor himself acknowledged that there is a problem of gun violence in this country and in this state and we maintain that there are ways to significantly reduce the violence through new common-sense legislation on both the federal and state levels. We are encouraged that Governor Christie specifically referred to New Jersey's longstanding and effective ban on assault weapons as a "common sense" measure. However, we would ask the Governor, “If it is good common sense for New Jersey, why not for the nation?” Governor Christie repeatedly refused to address the proposal for a new Federal Assault Weapons Ban and the rest of President Obama’s proposals to reduce gun violence, citing that it was not appropriate for him to comment on this federal issue before Congress. Nicola Bocour, Project Director of Ceasefire NJ, said, "It was puzzling to hear the Governor brag about the number of hours he spent on the phone during the holidays pressuring members of the House and Senate on Sandy relief aid. He was very effective there. How could he, almost in the same breath, claim that he has no influence over Congressional action on gun violence prevention proposals?" Ceasefire NJ does intend to meet with the Governor’s task force to discuss gun violence prevention policy in New Jersey, but we believe that there are many actions that can be taken immediately to reduce gun violence and will advise that measures be taken before the 60-day time frame the Governor has allotted. For example, we are delighted that the Governor endorsed cracking down on illegal gun trafficking into New Jersey by citing the effectiveness of efforts to go after such illegal sales in originating in such lax gun law states as Ohio. We strongly urge additional such operations targeting illegal guns coming into the state and will recommend that New Jersey consult with New York City Mayor Bloomberg who has successfully reduced illegal guns on their streets using such tactics. The landmark case District of Columbia vs. Heller (2008) was the first time the U.S. Supreme Court ruled that the Second Amendment upholds an individual’s right to possess a firearm. Contrary to popular opinion, this is actually a novel interpretation of the Second Amendment. The Palmer Square Green glowed with the light of dozens of candles tonight as about 300 people from various faith walks joined together to remember the victims of the Sandy Hook Elementary School shootings in Connecticut. Muslims, Christians, Sikhs, Hindus, Buddhists and people of other beliefs gathered to take part in the “Gathering of Remembrance, Unity and Hope” sponsored by the Princeton Clergy Association, Coalition for Peace Action, the Princeton University Office of Religious Life, the Fellowship In Prayer, Palmer Square and the Nassau Inn. Click here to see a photo gallery of 41 photos from Mercerspace.com. Ceasefire NJ (CFNJ) is the oldest and largest gun violence prevention group in NJ. It is a Project under the umbrella of the Princeton-based Coalition for Peace Action (CFPA). Its major successes have included preserving New Jersey’s Assault Weapons Ban against an effort to rescind it (1993); passing into law the first Childproof Handgun Bill in the nation (2002); and over-riding in the NJ Senate Gov. Christie’s veto, after over 50 failed attempts, of a gun violence prevention bill (2015). CFNJ coordinates statewide organizing on gun violence issues, convening monthly conference calls of grassroots leaders from across the state, as well as periodic statewide in-person meetings. CFNJ’s leaders are frequently covered in media across the region. Recent op-eds and articles have appeared in numerous newspapers across the state, as well as television and radio outlets.